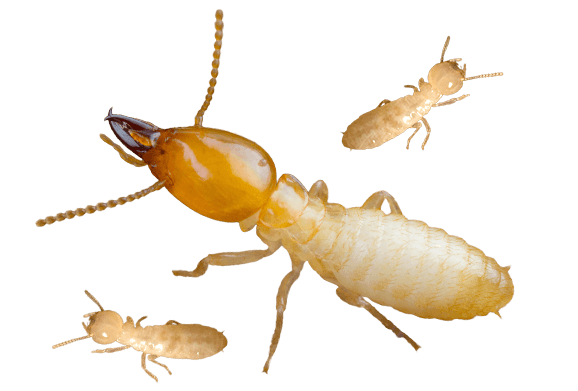 Subterranean termites are the most common and destructive termite in the United States. Interestingly, they are found in every state except Alaska. Subterranean, by definition, means “situated or operating beneath the earth’s surface; underground.” These insects make their home (a nest of colony) primarily in the soil of wood beneath the soil. They tunnel through the ground, searching for trees, brush and other decaying wood (preferred) found in nature. If this primary source is reduced or absent, termites look to other food sources, namely, your home. Termites are insects with a very defined social strata. A mature termite colony may number in the millions, with each member fulfilling a defined biological role. The castes, not including nymphs (immature termites), are called workers, soldiers, and reproductives. Typically, a queen and king reside in a mature colony.Winged adults are referred to as “swarmers.” They emerge from the colony and take flight (swarm) during certain seasons of the year, usually late winter to early spring. This marks the beginning of the termite reproductive cycle, as the swarmers are the primary reproductives. Swarming is also significant, as it is during this time that they are most likely to be spotted by humans.